We are pleased to invite you to attend our festival this Labor Day Weekend. We will be celebrating our 38th anniversary this year. Please watch our web site for updates on our schedule of events and attractions. Many of the favorite attractions will be returning, as well as new attractions we are adding this year. 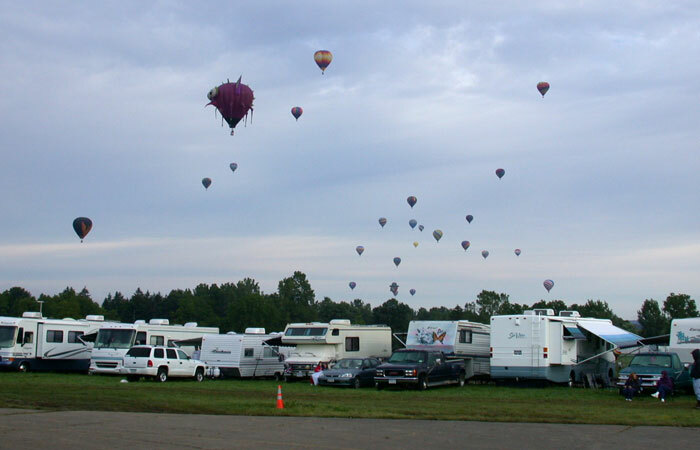 To attend: Please complete the camping registration form and return it no later than August 1, 2019 along with your check, money order, or credit card information made payable to “Dansville Festival of Balloons LTD” to pre-register. Keep this information sheet for future reference. The camping fee includes festival admission for 2 people. Children under 12 are free. Admission bracelets must be worn on festival grounds. Daytime visiting guests can pay admission at the gate upon arrival. The non-refundable fee for each site is $ 30.00 per night and is payable when registration is submitted. There is a 2 night minimum stay required. Registration hours are from 8:00am till 6:00pm on Friday and Saturday. Check out time is Noon. Follow signs to the camping registration area for your lot assignment. Units must be self-contained. Electrical power is not available. A dumpster is available for your trash. Portable Johns are available in the camping area. Quiet time is from 11PM till 7AM. If two or more campers wish to be next to each other they must arrive together. A maximum of 60 units will be accepted, first come first serve. All lots are 30 ft wide and 50 ft deep. If you need more space please specify or contact the camping coordinator. Dept of Health regulations require Camping units have 10 ft clearance between the units including tents, awnings and extensions. NO campfires will be allowed. There will be a $35.00 charge for any checks returned by the bank. You will receive a confirmation number & additional information by mail upon receipt of your completed registration form & payment. The confirmations will start to be mailed by mid July. Firearms or weapons are not permitted on the festival grounds. Pets must be confined to your camping site, they must be leashed and “pooper scooper” rules apply. Only Service Dogs(guide/handicap assist) will be allowed in the exhibit area, launch field or attraction areas. Bring Pet vaccination records with you.